Council bosses have approved plans to close South Shields School, despite a campaign by parents and teachers to keep it open. The struggling school, in Nevinson Avenue, South Shields, has been facing an uncertain future since it was rated ‘inadequate’ by Ofsted and failed in its bid to become an academy. South Shields School will formally close on August 31, 2020. This afternoon, South Tyneside Council’s decision-making cabinet confirmed they will pull the plug on funding the school, meaning it will formally close on August 31, 2020. * All current pupils will complete the current academic year (2018/19). * No Year 7 pupils will join in September 2019, while pupils due to enter Year 10 will be moved to minimise disruption to their GCSE. * Pupils due to enter Year 11 will be allowed to complete the 2019/20 academic year, as will children in Years 8 and 9. An ‘Inadequate’ inspection by inspectors from schools watchdog Ofsted in 2017 forced the school to start the process of conversion to academy status. But a combination of low pupil numbers and a multi-million pound debt meant it was unable to find a sponsor to do this. The school was re-built in 2011 under the terms of a £24million Private Finance Initiative (PFI) deal - which commits it to repayments worth £400,000 a year until 2036. Funding tied to pupil numbers has made finances a struggle. In November the school had about 550 pupils out of a total capacity of 850, with numbers continuing to shrink as parents moved their children to other schools due to uncertainty over its future. The council has previously been criticised for putting cash ahead of children, but the report insists alternative options to closing the school would not ‘resolve the underlying viability issues'. 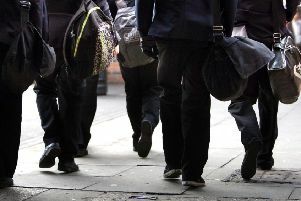 Closure of South Shields School will leave South Tyneside with eight secondary schools, four of which have sixth forms.